- Beautify your outdoor event or living space by hanging plant baskets, flower pots, bird feeders, lanterns or lights, holiday decorations, wind chimes, ornaments, and more! - 35 Inches tall minus 6 inches in the ground. 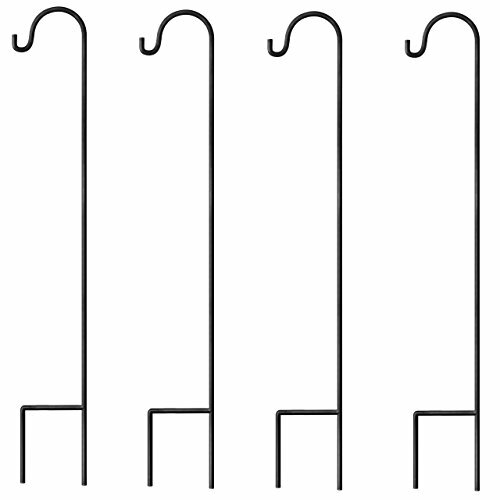 - With a dark finish and immaculate shine, this hook complements anything that you decide to hang on it. - Looks visually stunning in your flower bed, wedding isle, or other locations. - Premium quality metal, thin yet sturdy, rust resistant and durable. 0.3 inch diameter is 15% thicker than the competition. Bring your heaviest bird house or flower basket. - Designed by the brightest minds, utilizing only the highest quality materials and expert manufacturing methodologies, GrayBunny offers premium products for your home and garden while exceeding highest industry standards and offering impeccable customer care. Click the "Add to Cart" button on top to accessorize your outdoor living or event space space now! STYLISH: Traditional look and dark finish adds elegance and beauty to your garden. Stunningly complements anything that hangs from it. With a 3/10 inch diameter pole that is thicker than similar hooks from other brands, you can be confident you're getting the strongest shepherd's crook on the market! Stands 35 inches tall, 29.5 inches long above the floor.